Silver spot prices are taking their lead from the gold market at present and pausing for breath following the recent rally, with yesterday’s candle finishing as an up bar sandwiched between the 9 day and 14 day moving averages. 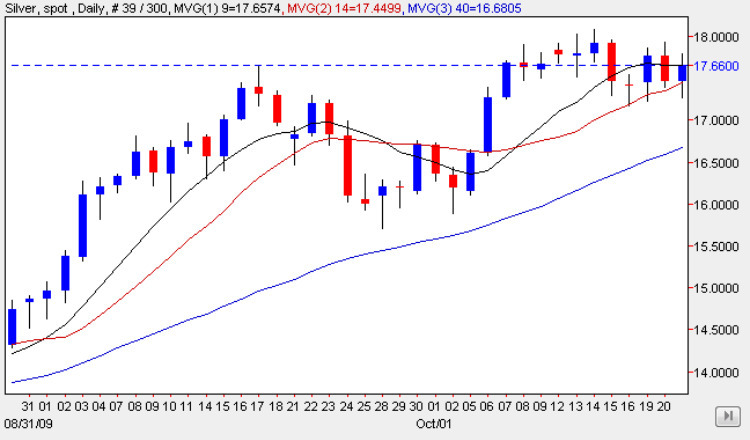 Whilst the current sideways consolidation is a worrying trend, the positive signal from yesterday’s silver trading session was that the open of the day found good support from the 14 day moving average once again. The key of course will be whether silver prices can break and hold above the $18 per ounce level – if so then we should see a resumption of the recent rally as we can then approach our short term target for silver prices of 18.50 per ounce which if achieved would then provide a solid platform of support for a move higher in due course.